In dogs, diarrhea can indicate a serious medical problem or a minor digestive disturbance. Most dogs will experience a case of diarrhea at some point during their life. While a mild case of diarrhea is usually not a cause for alarm, it is the most common sign of an intestinal disease. As a dog owner, you should learn about the different causes of diarrhea in order to recognize if the condition is an early symptom of a major illness. Diarrhea is a condition in which a dog passes an abnormal amount of loose or liquid stool. The stool may also contain other matter such as mucus, blood or parasites depending upon the cause. Other signs of illness may accompany diarrhea such as gas, burping, vomiting, loss of appetite or lethargy. A dog may experience diarrhea for many reasons. A case of diarrhea may have a minor cause such as an abrupt diet change or a more serious cause such as inflammatory bowel disease. While diarrhea is a typical symptom of an intestinal disease, there are many other causes. Change in diet: Abrupt changes in diet can cause digestive upset. Milk intolerance: Adult dogs may be lactose intolerant and experience upset after consuming milk. Food Allergy: Dogs may get diarrhea as a symptom of an allergy to a food or food ingredient. Some dogs are allergic to common protein sources in canine food such as beef and gluten. Eating out of the garbage: If the dog gets into the garbage, she may end up with a case of mild or severe diarrhea, after consuming spoiled food. Foreign objects in the intestines: If a dog eats a foreign object such as a bone or stick, it can get stuck in the intestinal tract and produce watery stools and vomiting. Bacterial and viral infections: Parvovirus, distemper, coronavirus, salmonella or hepatits can cause severe or explosive watery stools. Worms and Parasites: Worms such as roundworms and whipworms can cause diarrhea. Internal parasites such as giardia and coccidia can also cause a case of waery stools. Malabsorption Syndrome: Malabsorption Syndrome is a condition in which the intestines are either unable to digest food or cannot absorb nutrients from food. A greasy liquid stool with a foul odor may be an early sign of this disorder. Inflammatory Bowel Disease (IBD): Chronic diarrhea is a sign of IBD, a group of intestinal diseases that cause inflammation of the intestinal lining and food malabsorption. Colitis: Colitis, the inflammation of the colon, may cause chronic loose stools with mucus. Pancreatitis: Chronic loose stools are a symptom of pancreatitis, the inflammation of the pancreas. Protein Losing Enteropathy (PLE): PLE is a life-threatening disease of the small intestines in which the body losses protein. Symptoms include severe watery stools, vomiting and fluid build-up under the skin or abdomen. Acute Hemorrhagic Gastroenteritis: Acute hemorrhagic gastroenteritis is a life-threatening condition that produces severe bloody diarrhea and vomiting. Poisoning: Consuming a something poisonous may cause severe loose stools and vomiting. Only a veterinarian can diagnose the true cause of a case of diarrhea after an examination and lab work. When it comes to dog health, diarrhea does not always warrant a trip to the veterinarian. If your dog acts normal and experiences only a mild case of watery stools, it can be treated at home. Provide plenty of water to make sure that your dog does not become dehydrated. Withhold food for 24 hours. Feed the dog a bland diet for two days or until his stools return to normal. You can feed your dog a homemade bland diet such as cooked chicken and rice. Bland prescription dog food is also available at many veterinary offices. Once your dog's stools return to normal, slowly introduce his regular dog food back into his diet. Mix small amounts of his regular food with the bland diet for three to five days. Increase the amount of regular food each day and decrease the amount of bland food in the dog's diet until he eats the regular food exclusively. A mild case of loose stools should resolve in 24 to 48 hours. 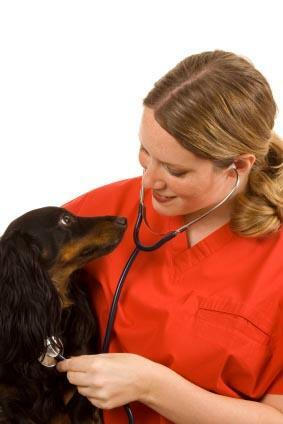 A veterinary consultation is recommended if the diarrhea lasts more than two days. However, call the veterinarian even if the stool problem is mild but your dog acts extremely ill. Take your dog to the veterinarian immediately to rule out serious medical conditions if the stools appear painful to pass, bloody or accompanied by frequent vomiting. Seek immediate veterinary attention if you suspect your dog ingested poison or a foreign object. It can be frightening when your dog experiences diarrhea. Yet rest assured that most cases of loose stools are mild. Many of the diseases and disorders associated with chronic diarrhea are managed with an appropriate diet and medication so that an affected dog can live a full and healthy life. You can protect your dog's health by making sure that he eats a quality dog food, gets regular vaccinations and heartworm prevention medication, maintains a healthy weight and lives in a safe environment.